Bloomington, September 18, 2012: Tata Consultancy Services (BSE: 532540, NSE: TCS), the leading IT services, consulting and business solutions organization, today, announced the official opening of the TCS Solutions Center - Minneapolis in Bloomington, Minnesota. The inauguration of TCS’ newest facility was celebrated with a ribbon-cutting event on September 14, 2012. Normandale Lake Office Park, the 50,000 square foot facility will be home to roughly 300 TCS employees. The center will serve as a hub for delivering technology services to customers in the region and is an integral part of TCS’ Global Network Delivery Model™ (GNDM™), which provides a quality of service and certainty of outcome that TCS’ customers have come to rely on. The Minneapolis facility is the latest addition to TCS’ growing operations across North America. 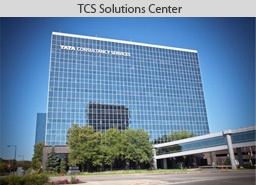 TCS won its first North American client in 1971 and set up operations in New York City in 1979. TCS now has eighteen offices across the United States offering innovative technology solutions and services that provide its customers with a competitive edge in the marketplace.